With a welcome mix of humor, heart, and high-stakes drama, Sabina Khan provides a timely and honest portrait of what it's like to grow up feeling unwelcome in your own culture. Fight for love. Fight for family. Fight for yourself. Seventeen-year-old Rukhsana Ali has always been fascinated by the universe around her and the laws of physics that keep everything in order. But her life at home isn't so absolute. Unable to come out to her conservative Muslim parents, she keeps that part of her identity hidden. And that means keeping her girlfriend, Ariana, a secret from them too. Luckily, only a few more months stand between her carefully monitored life at home and a fresh start at Caltech in the fall. But when Rukhsana's mom catches her and Ariana together, her future begins to collapse around her. Devastated and confused, Rukhsana's parents whisk her off to stay with their extended family in Bangladesh where, along with the loving arms of her grandmother and cousins, she is met with a world of arranged marriages, religious tradition, and intolerance. Fortunately, Rukhsana finds allies along the way and, through reading her grandmother's old diary, finds the courage to take control of her future and fight for her love. 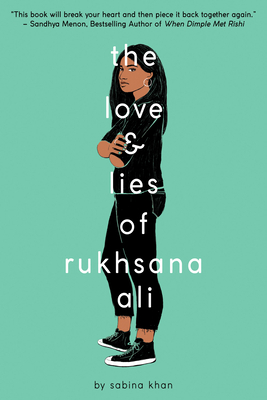 A gritty novel that doesn't shy away from the darkest corners of ourselves, The Love and Lies of Rukhsana Ali provides a timely and achingly honest portrait of what it's like to grow up feeling unwelcome in your own culture and proves that love, above all else, has the power to change the world. Sabina Khan writes about Muslim teens who straddle cultures. She was born in Germany, spent her teens in Bangladesh, and lived in Macao, Illinois, and Texas before settling down in British Columbia with her husband, two daughters, and the best puppy in the world. Visit her online at sabina-khan.com.